Built with today's travelers in mind, Courtyard Columbia comes fully equipped for your stay in Missouri. 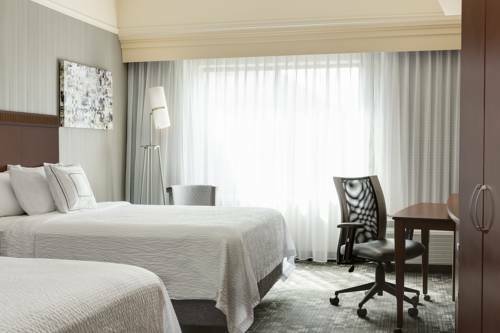 Unpack and unwind in spacious rooms and suites featuring plush beds with cotton-rich linens, custom duvets and fluffy pillows. Free high-speed Wi-Fi and large flat-panel TVs with pay-per-view movies and premium cable channels are available and help you feel more at home. Easily go from landing at Columbia Regional Airport to landing in your bed with our free airport shuttle service to and from the hotel. Healthy meals, evening beverages and signature Starbucks drinks await you at our on-site restaurant, The Bistro - Eat. Drink. Connect. Active travelers will love our 24-hour fitness center featuring modern cardio equipment, free weights and weight machines. We also offer a refreshing indoor pool, open all year long. Perfect for prospective students and families, our hotel is located near University of Missouri and Mizzou Arena. Easily blend work with play when you stay at our downtown hotel today.